Flaky, wild-caught whole white fish fillets. For a hearty, pub-style taste of seafood, there’s no beating our Beer Battered Fish Fillets: flaky and coated in a crispy draft beer batter. 3. Bake 17-19 minutes total*. Flip after 12 minutes. For extra crunch or cooking more than 4 fillets, add 3 minutes to the cooking time. 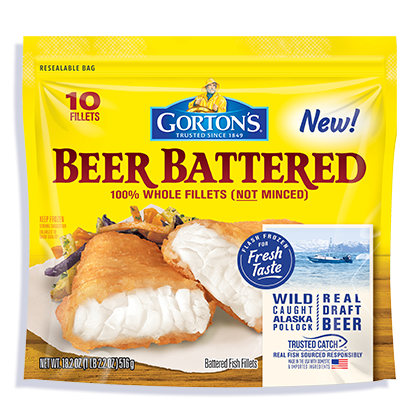 INGREDIENTS: Alaska Pollock fillets, batter coating, vegetable oil. Rice flour, water, wheat flour, beer (water, barley malt, corn, rice, hops, yeast), tapioca dextrin, modified corn starch, salt, whey, dextrose, baking powder (baking soda, sodium aluminum phosphate, cream of tartar), sunflower lecithin, xanthan gum, natural flavor.